As the book states, even those who have only a smattering of World War One knowledge have heard of 'Bloody April'. The month of death came about because of two things. First was the arrival of the new German fighter plane, the Albatross DIII. Second, the Allied offensive took place on the Arras front. The Allies not only had to battle the Germans, but the wind blew from west to east most of the time. With the allied offensive, it meant that the RAF and French Air Force had to invade German air space with as many planes as they could get in the air. This was a recipe for, as the book puts it, "In many respects the relationship between the German fighters, Allied fighters and Corps aircraft would be akin to sharks among minnows in the coming battle"! The book itself is a tour de force of scouring day to day flight and loss records of all of the combatants in the month of April 1917. The book lists weather conditions and much more for each day. Every day is gone through separately with a write up on the 'British front' and the on the 'French front'. After each write up for the day is a separate index of the day's losses and claims followed by actual Allied casualties. There are three appendices of the British, French, and German claims, followed by the known German casualties for each day. Most pages are filled with pictures of pilots that we have never heard of before. The pictures are accompanied by small biographies of each pilot. The book does not dwell on the why, but it is a true masterpiece of the who, when, and where. 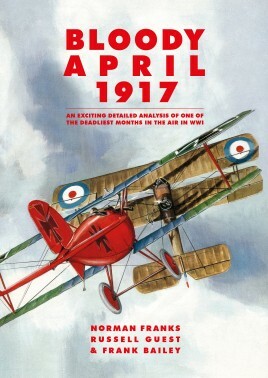 Nowhere will you find such an exhaustive book on the day to day events of the aerial war over the Western front in April 1917.